What’s In The Box? (Or: Hello, Slim!) | "DESTROY ALL FANBOYS!" Holy hell, my long national nightmare is OVER. 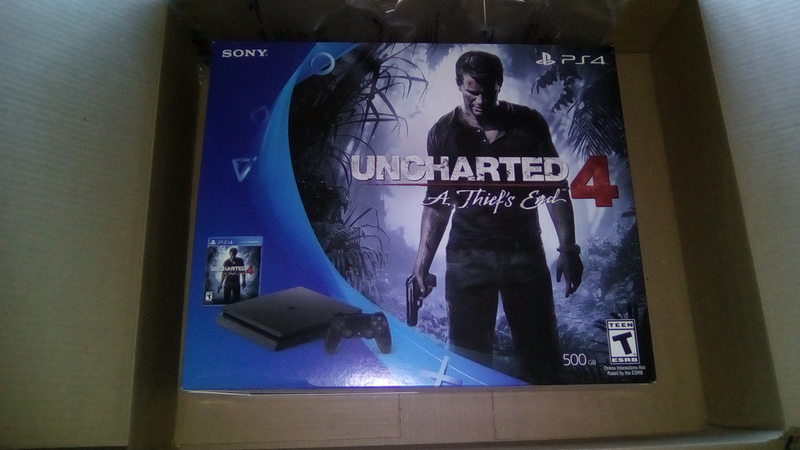 I’ actually too damn busy to post the whole story here, but it involved a refund, a quick re-buy and this thing showing up SIX DAYS EARLIER than the expected date. Wow, but YES, I’ll take that over the nonsense I went through for too long last month. Anyway WHEE. Wait, my workload just tripled? WHEEEEE!! Um, back in a bit. I need to go lie down, have a drink, fry some chicken to celebrate and play a game or three. All at the same damn time. Whee? This entry was posted in 2016, Commentary, DAF, Features, Humor, Updates and tagged Finally!, Gifts, I Got My Cake!, Photos, PlayStation 4, Playstation Network, PS4, PSN, SCEA, Sony, VGA 101, Videogame Appreciation 101, Work by geelw. Bookmark the permalink. Outstanding! I’m glad you got everything sorted. And I love that you’ve got yourself a PS4! I’ve been loving mine. And that Uncharted 4 looks like it going to be a great game! Let me know what you think of it.